Please note that not all sizes are available in all countries. Please check with your nearest stockist. 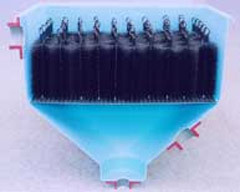 The measurements given refer to the main body of the brush. This figure shows an example of a brush measuring 16″ x 6″ (40cm x 15cm). End measurements are the same for all brushes.